There isn’t a problem in life which can’t be solved without the use of Coconut Oil, Duct Tape, or WD40, oh and maybe a cup of tea. I’m convinced these three things are perhaps the only thing you need. I’ve been religiously using Vita Coco Coconut Oli for around a year now after taking the plunge to buy one after hearing beauty bloggers banging on about it and now I myself have become a preacher. So when Vita Coco got in touch with me to ask me how I used mine, I was delighted to be able to share my uses! I predominantly use Vita Coco Coconut oil on my skin, I’ve suffered with acne at varying levels of severity since my early teens. I thought as I was approaching 30 my skin would calm down, however, I have still been plagued with the issue. Coconut oil contains lauric acid, which has natural antibacterial properties and is so gentle for your skin. Acne treatments often are like paint stripper, removing the natural protective oils of your skin, promoting your skin to over produce oil, sometimes making the issue worse. Coconut oil, is gentle antibacterial and helps to sooth acne skin, as well as aiding to repair any scars. I’m pleased to say that my skin has never felt of looked better since I’ve started my nightly routine of taking off my make-up with it and smothering it over my face before I go to sleep. Sure some of it rubs on my pillow, however, it doesn’t leave a stain and soaks into my skin overnight. As well as using it as the main ritual for my skin, I use coconut oil to treat my hair. I’ve always had really long hair and as I have got older I’ve realised how important it is to protect it and look after it. I’ve completely reduced the amount of times I wash my hair a week and only wash it now when necessary. I find that through this process my hair doesn’t get as greasy and can now go about 6 or days without washing. That leads to less products on my hair and less damage styling. Every time I wash my hair I treat the ends to a coconut mask, coating them in the stuff and leaving it on whilst I have a bath for around 30 mins. I then shampoo it out. It leaves the end of my hair smoothed and moisturised. Additionally, if my hair is looking a bit wild, I warm a small amount of oil in my hands and use it as a serum to smooth fly-aways. If I’m feeling extra indulgent I’ll add a scoop into my warm bath water to help smooth my skin and make it feel silky soft. In addition to soothing cuts, insect bites and dry skin, I also use coconut oil in my cooking. I’ve replaced my olive oil use with it and use it to cook omelettes, stir-fry’s and add a spoon of it into my smoothies to make them extra smooth. To be honest there isn’t much I don’t use it for! I’d love to hear of your uses, how do you use yours? 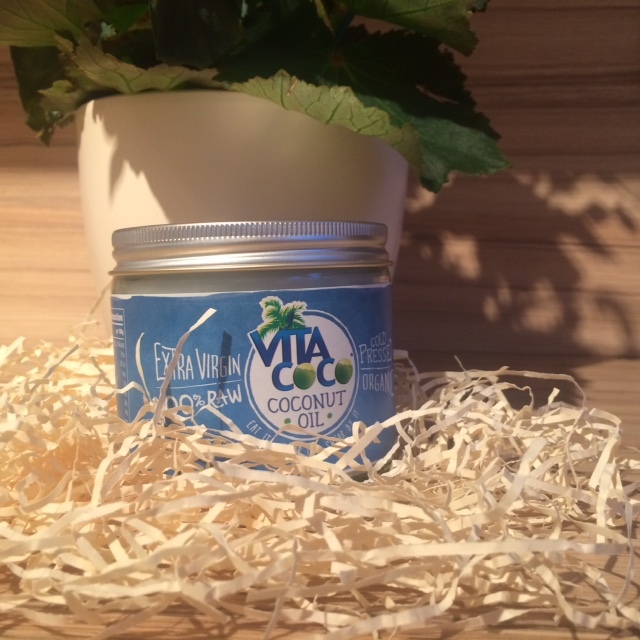 Vita Coco kindly sent me a new pot of Coconut Oil for this post. Let me know what you think of the post, slightly different to my normal style. This entry was posted in All Posts, Fashion & Beauty. Bookmark the permalink. Hi Emma as a virgin to using coconut oil……I wanted to get some sound advice….so I looked up your blog. Your tips are very good …at the moment I am just using it internally….but I will definitely be using it for my hair and skin….I will let you know how I get on !!! !